1. Boil chicken and split into thin pieces. Cut all vegetables into appropriate sizes. 2. Dip rice paper in the water for 3 seconds and fish it out. Leave it on the cutting board without wiping the water. 3. When the rice paper became soft, spread chiken and vegetables on the center of rice paper. 4. 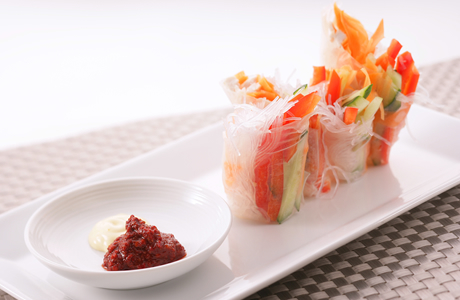 Roll the rice paper tightly yet gently. Fold the sides in and cut in in half. Place them on the plate REDMAMA on the side.